When Olusegun Obasanjo left office. Africa was $76 billion out of debt. That was because he negotiated with the western world to reduce or eliminate the debt of 30 African nations. Not even 12 years later Africa nations are back in debt, this time with a vengeance and they are crossing a dangerous line. 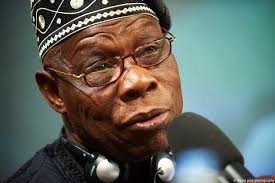 In the past when nations went into debt if they cannot pay, someone like Obasanjo will go and negotiate them out of the debt. This time, we are falling in the Chinese debt trap. That is when China will borrow you money and ask you to use your mineral reserve in the ground as collateral. It means if you cannot pay the loan back they will come and take over your mineral reserve. For example, an African nation with oil or gold reserve can use that reserve for collateral to borrow money easily. If they don't pay back the Chinese will come and take over that reserve in about 10 years. Chinese have already taken over airports and electricity companies in Africa. They will run these infrastructure and make additional billions from it. Soon they will take over higways and give them Chinese names like Shangai highway and build toll gates to collect money from you. And Africans will be singing and dancing. Oh Africa, What has happened to you! Almost all Sub Saharan African nations have gone to get this easy money. The Chinese do the assessment and tell the African nations what is in the ground and how much it is worth. The Africans agrees and burrow the money without the intention to ever pay back. The problem is, this type of debt cannot be reduced or negotiated out. Soon the Chinese might own your village and you will be the slave and there is nothing you can do about it then. Meanwhile, Africans are busy sleeping and partying and spraying the little money they have while things fall apart around them. This is how the first slave trade started. Now Africans are repeating history. Later, they will shout that nobody told them. But I am telling you now. It is time Africans must wake up before it is too late.